The Digital Phoenix project is a multiyear project aimed at developing a realistic digital representation of the Phoenix metropolitan area through space and time that can be experienced in Arizona State University’s Decision Theater. A significant objective of this project is to create an environment for querying, researching, and visualizing critical issues confronting our rapidly urbanizing area about urban sustainability. By creating a multidimensional virtual model of Phoenix from a variety of data sources, we will be able to visualize patterns of growth and development, as well as their consequences, that emerge across the continuums of space and time. The modeling of future environments will enable the assessment of policy scenarios that enable desired future urban-environmental patterns. A digitally constructed model of the city will also allow us to discover what Phoenix could have been like, starting with historical data as the basis for projecting to the present and into the future. The presentation will illustrate some of the main themes of the Digital Phoenix project and provide examples of how the tools developed in this project can be used for scenario generation and policy analysis. The illustrations will include visualization of richly textured immersive environments in downtown Phoenix, scenarios of future patterns of development in Maricopa County based on policy parameters, consequences of such development for air quality, material use, and sprawl, and visual representations of the evolution of transportation and land use patterns in various parts of Phoenix. 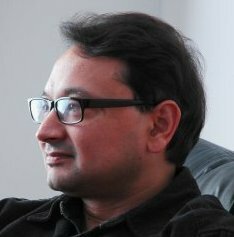 Prof. Subhrajit Guhathakurta is Professor with appointments in the School of Planning and the Global Institute for Sustainability at Arizona State University. He has played a lead role in developing the Urban Modeling and Simulation Lab in the Herberger Center at the College of Design where a version of UrbanSim modeling environment has been implemented for Maricopa County. He is currently directing the Digital Phoenix Project that is developing tools for visualizing the evolution and the future growth of the Phoenix metropolitan area. He has written several papers on the theoretical aspects of planning models and the powerful communicative impact of dynamic simulation. His article on the interface between urban modeling and planning theory was awarded the Chester Rapkin Award for the best paper in volume 18 (1999) of Journal of Planning Education and Research. He was involved in developing an integrated urban and environmental model of the San Pedro watershed in southern Arizona, which incorporates hydrologic, and residential development components. Recently, he published an edited book titled “Integrated Urban and Environmental Models: A Survey of Current Applications and Research” (Springer-Verlag, 2003). He has held visiting appointments at the Center for Urban Spatial Analysis at University College London, and at the Center for Sustainable Urban and Regional Futures at the University of Queensland in Brisbane.